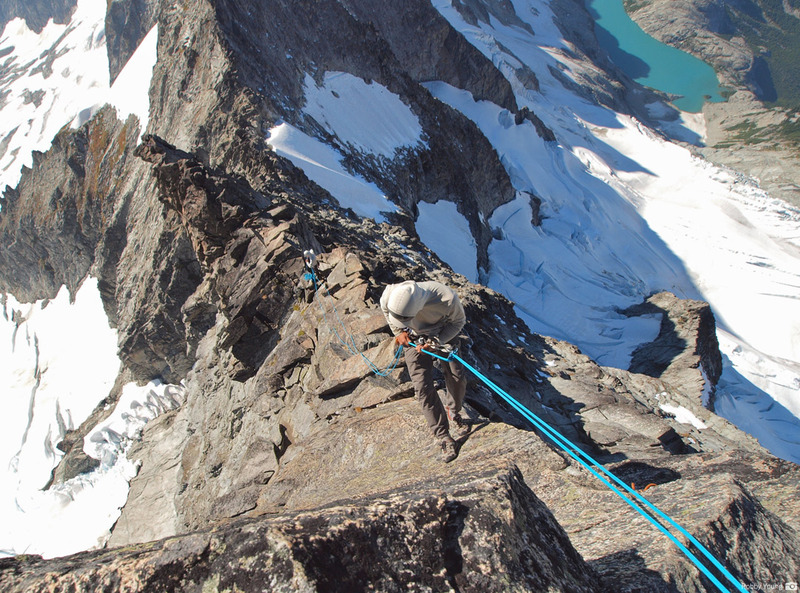 Forbidden Peak's West Ridge is an unforgettable alpine climb and one of America's most sought-after ascents. 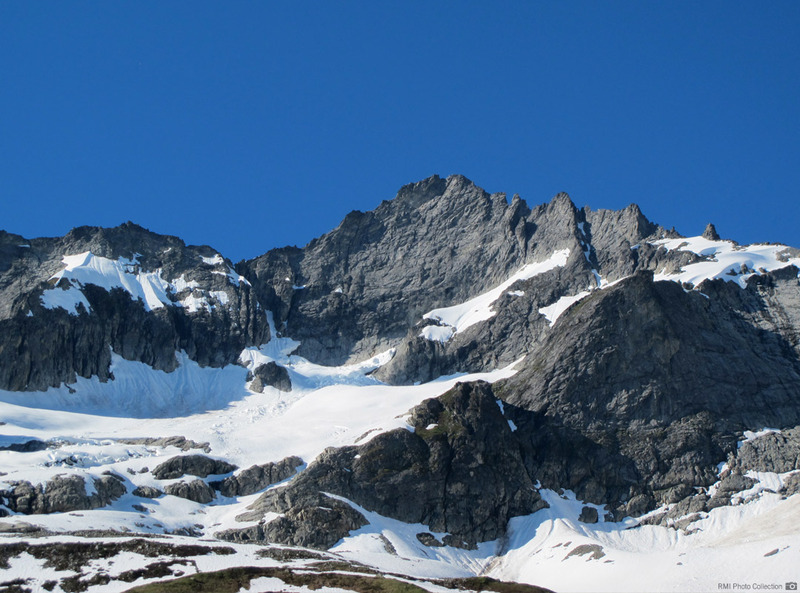 Prepare for the ascent on the snow slopes and rock faces in beautiful Boston Basin of the North Cascades. 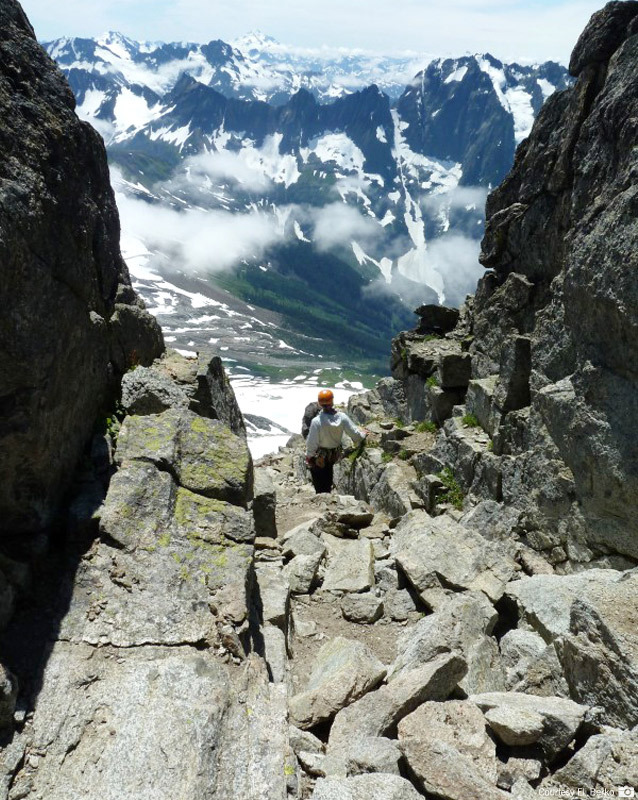 Traverse the exciting and stunning line of Forbidden Peak's West Ridge to the mountain's summit. 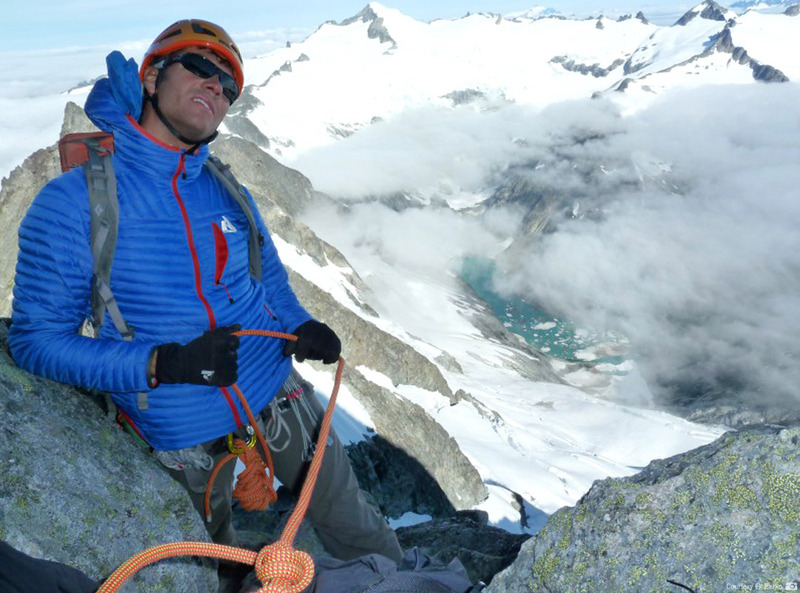 Climb with the expert leadership of RMI's guides and a 2 to 1 climber to guide ratio. 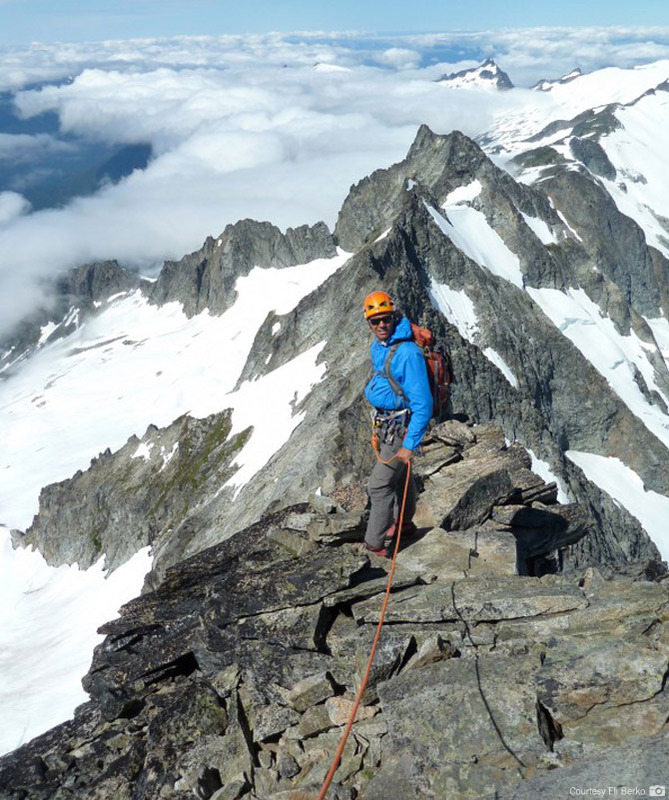 Renowned for its exciting and classic terrain, the West Ridge of Forbidden is a tremendously rewarding climb that has earned its place as one of the "Fifty Classic Climbs in North America". The route features impressive views of surrounding Cascade peaks like the spectacular North Face of Johannesberg, the Quien Sabe Glacier on Sahale Peak, as well as the airy view down the North side of Forbidden to the remote Moraine Lake. Located in the heart of the North Cascade National Park, Forbidden rises to a height of 8,630 feet. The route consists of climbing a small glacier below the South Face and then low 5th class rock and 40- to 50- degree snow and ice in the West Ridge Couloir. At the top of the couloir we cache our glacier gear and don rock shoes for the enjoyable 5.0 to 5.6 rock climbing along the exposed crest to the summit. 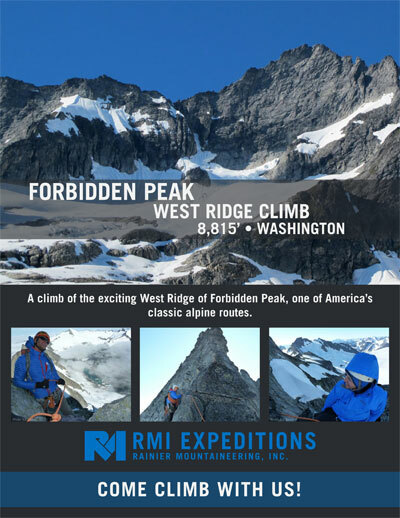 The West Ridge of Forbidden is a true alpinist's classic. 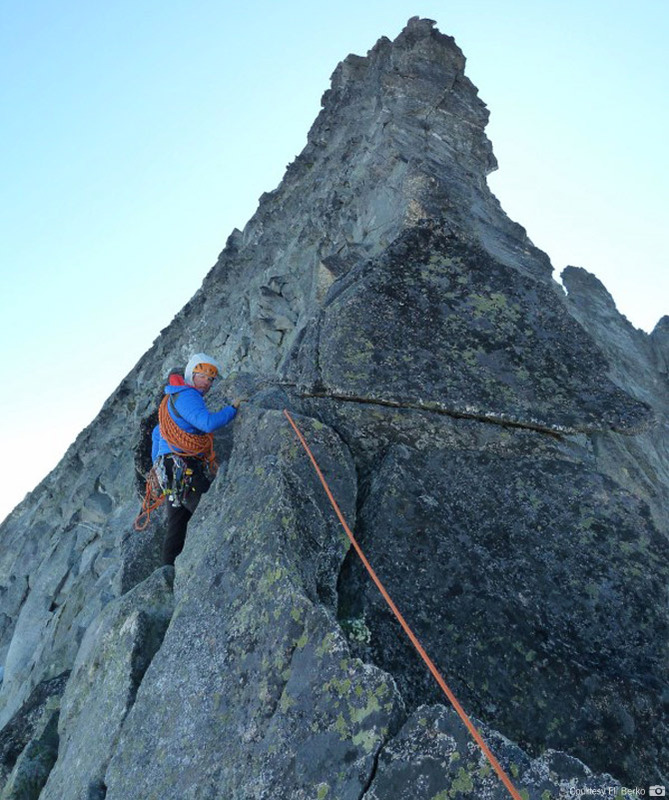 A day of climbing instruction and review are included in the itinerary and may include an ascent of an easier local objective such as Sharkfin Tower or Sahale Peak. We lead the West Ridge at a 2 to 1 climber to guide ratio ensuring that you receive a high degree of hands-on instruction prior to the climb and also have a small, efficient rope team during the summit ascent. 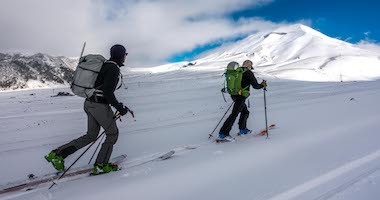 This is an intermediate level program for climbers in great physical condition with knowledge of mountaineering techniques and previous climbing experience. Climbers should be comfortable on 45 degree snow and ice slopes and climbing on exposed ridges. While previous rock climbing experience is not required some climbers have found it helpful. Give us a call if you are undecided regarding your skills. 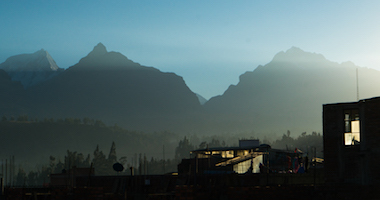 A full day of climbing instruction and review are included in the itinerary. Being my first trip to the Boston Basin, I didn't know exactly what to expect - but the setting and the climb up Forbidden is sublime. The options available in the basin for climbing are many and it's a fantastic place to send clients. Eric made the experience of this great place unforgettable and I can't wait to get back. As with other trips, I am extremely grateful for the chance to spend time in a beautiful, challenging environment with a guide like Eric. This trip was my first experience with significant exposure. I found it to be intense and mentally taxing beyond the physical demands--exactly the sort of thing that draws me to the mountains. The traverse climbing on the west ridge is awesome and the view is stunning there. BTW, I learned a lot on the alpine mountaineering and will be more experienced next time when I climb some big mountains. The guides, as always. Chase and Leon are awesome. The route was a close second. This was a custom trip. For me it was my first trip that had some more moderate technical climbing. It was amazing. The guides Leon Davis and Chase were great! They kept us safe and confident. I am very happy with both of the guides. I enjoyed having the flexibility to change the schedule with it being a private climb. The diversity of the terrain on both Forbidden and SharkFinn were amazing. Definitely pushed my limits. Both the guides were great! They both were super encouraging and communicated effectively. 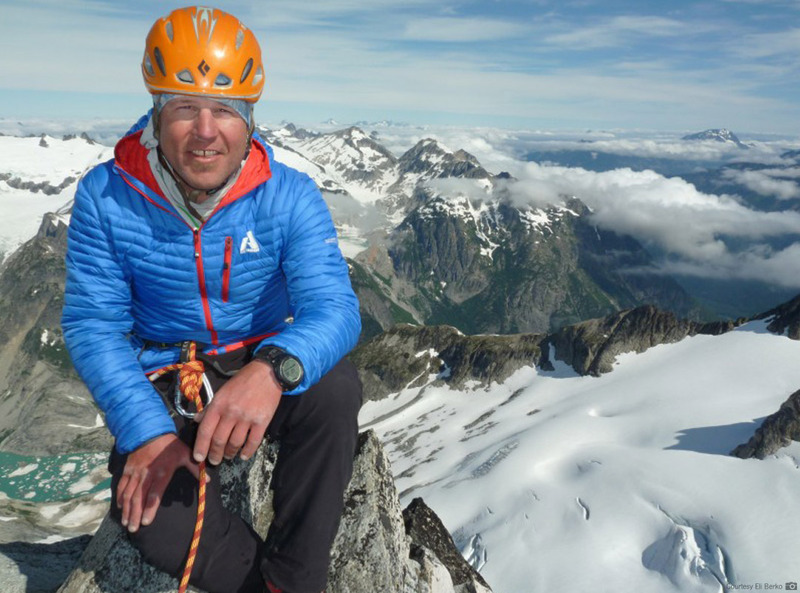 Additionally, on the summit day there were several situations that could have been dangerous, but the guides were calm and confidently able to improvise and mitigate the risks. I was very impressed with their ability to adapt to the situation so quickly and easily to avoid some huge risks on the mountain. Jake and Thomas were excellent guides. Perfect trip. My experience with Eric. The climbing was fantastic and when things weren't exactly as expected, Eric's leadership was stellar. 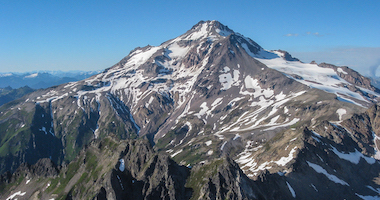 The group meets at 8:00 a.m. at the Marblemount Ranger Station in the North Cascades. Please see our Travel Details document for driving directions and carpool opportunities. Your RMI guides will meet you at the ranger station for introductions, group gear distribution and personal gear check. From Marblemount we follow the Cascade River Road to the trailhead. During our hike in to Boston Basin we gain approximately 3,000'. 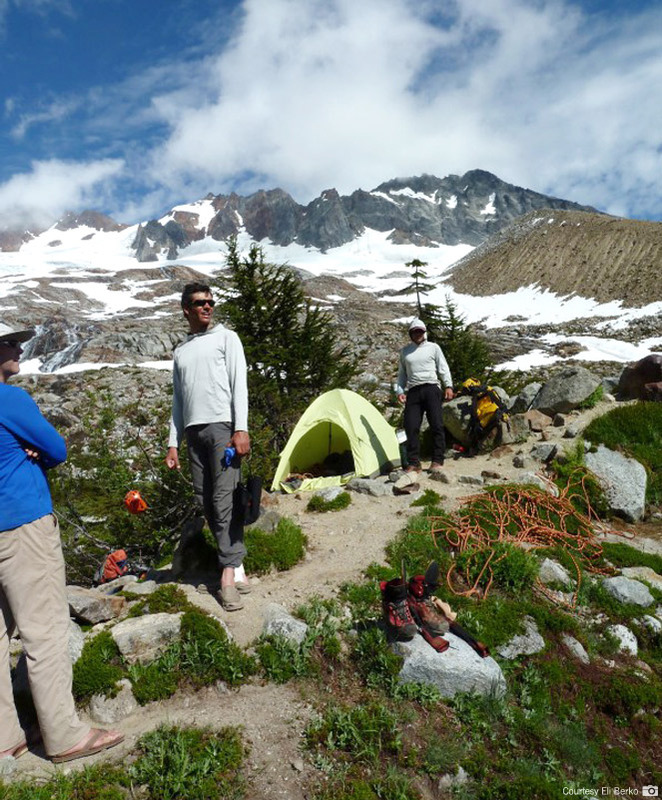 The hike through the forest and up into the alpine meadows takes half a day and gets us into camp at 6,200' in time for an early dinner. Our training offers participants an overview of various techniques which meet the challenges set forth by the West Ridge of Forbidden. The snowfields and rock above camp serve as our training ground. As part of our training day we may make an attempt on Sharkfin Tower or another moderate local objective. 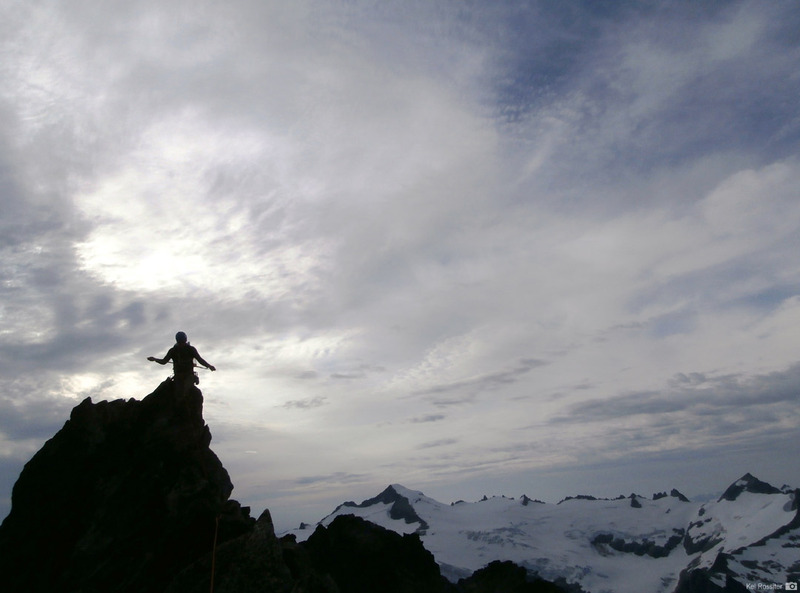 Our training will focus on movement skills, belaying and lowering techniques, glacier travel and self care skills. Our first priority is the safety of all team members. During the training you will be asked to demonstrate that your fitness will allow you to climb safely, and that you are able to perform the climbing skills proficiently. We will continue to assess each team member throughout the course of the training and the climb. The summit ascent - Our day begins with a pre-dawn alpine start to give us ample time for this full day of climbing. The route consists of climbing a small glacier below the South Face and then mid-fifth class rock and 40- to 50- degree snow and ice in the West Ridge Couloir. At the top of the couloir we cache our glacier gear for the enjoyable mid-fifth class rock climbing along the exposed crest to the summit. From the top the full majesty of the North Cascades is revealed with Mt. Baker to the northwest and views south all the way to Mt. Rainier. After spending some time on top to enjoy the views and take photos, we begin our descent. We rappel and down climb the ridge, make our way back down the couloir, and then into camp for an early dinner and to watch the sun go down over the peaks to the west. On our last morning we rise early for breakfast, break camp and take approximately two hours for the hike back down to the trailhead. The trip concludes with a celebratory lunch in Sedro Wooley. Those with a plane to catch should plan for an arrival in Seattle around mid-afternoon. Our meeting place is the Marblemount Ranger Station, 7280 Ranger Station Road, Marblemount WA 98267-9755. We meet at 8:00a.m. 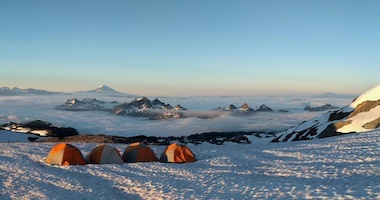 Most climbers will fly into Seattle-Tacoma International Airport (SEA) the evening before the program and rent a car for the 2-1/2 hour drive. The town of Marblemount is approximately 125 miles from SeaTac. Please click here for driving directions. You can find camping at the Glacier Peak Resort and Winery. They offer primitive secluded tent camping by the Skagit River, as well as wifi and basic amenity tent camping on their lawn. 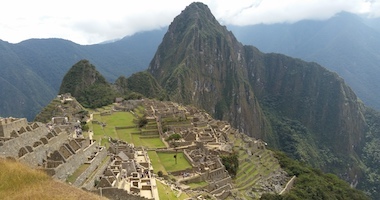 This trip is open to individuals in excellent physical condition with previous climbing experience. 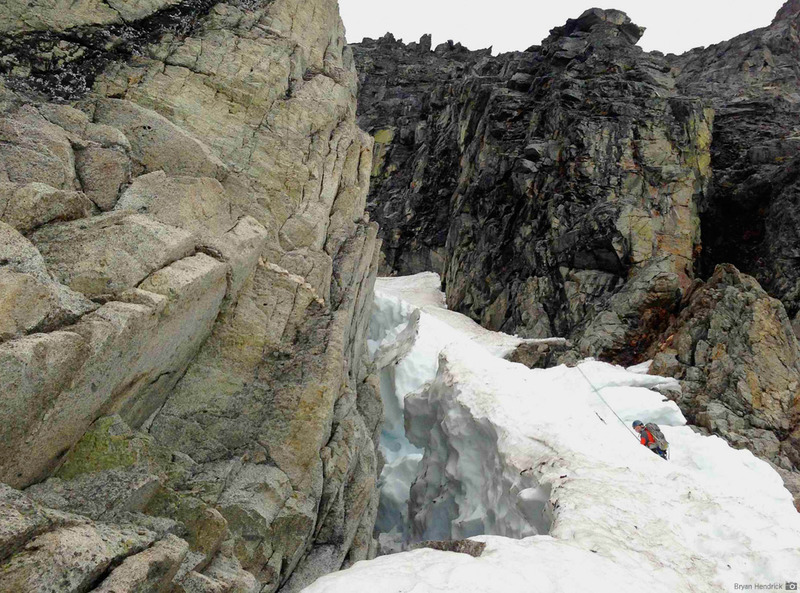 Prior knowledge of, and comfort with, rope travel, the use of crampons, and ice axe arrest are required. Successful completion of an RMI Expedition Skills Seminar on Mt. 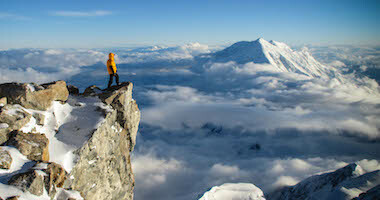 Rainier, in Alaska, Peru, Ecuador, North Cascades, or an equivalent multi-day mountaineering seminar is also required. While previous rock climbing is not required, some climbers have found it helpful. 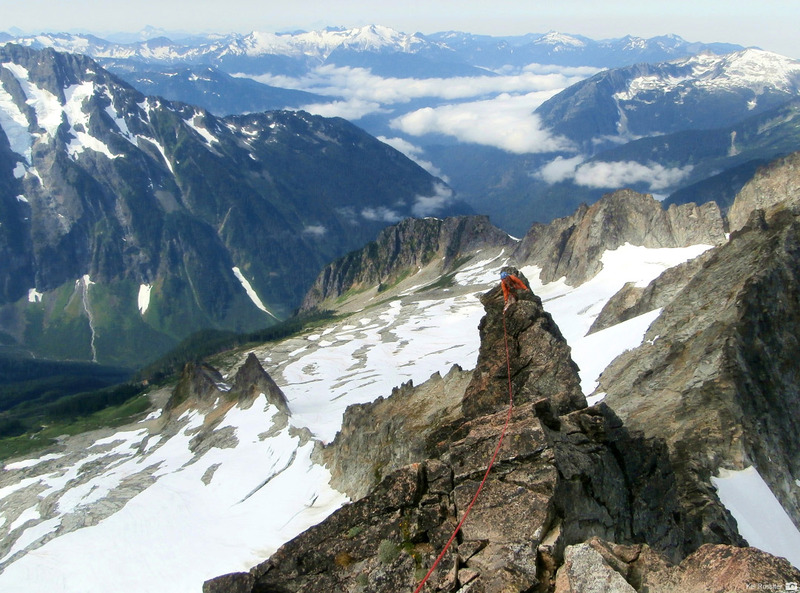 Mountaineering specific leather boots are the preferred choices for ascents in the North Cascades. Because of the amount of good rock climbing found on the West Ridge route, some climbers also bring a pair of rock shoes with them. A good compromise to carrying two sets of foot wear is one of the lightweight mountaineering boots made today designed for both rock and ice. These boots are sturdy enough for kicking steps and holding a crampon while also having sticky rubber and a good feel for the rock. Lightweight hiking boots are not acceptable as they don't work well with crampons, or in very cold or wet weather. On the Forbidden Peak - West Ridge climb you will need 3 mountain lunches, 3 dinners, and 3 breakfasts while on the mountain.